Protesters gathered at Federal Plaza in Chicago on June 18 to oppose U.S. military intervention in the Syrian war. "Hands Off Syria! No More Wars!" was chanted loudly by the participants during a 2-hour long picket and rally. 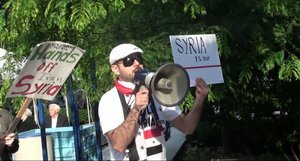 The protest was joined by members of the Syrian community who came out to say that the U.S. government has no right to threaten or overthrow the sovereign government of Syria. They also opposed sanctions, no-fly zones and spoke out against the allegations of chemical weapons use being used by the Obama administration to make their phony "humanitarian" case for escalation of the conflict. They carried signs that read, "President Obama: Syria is our Red Line!" The action was initiated by the Anti-War Committee of Chicago. ANSWER Chicago's John Beacham spoke at the rally. He called for an immediate withdrawal of all U.S. troops from the Middle East. Beacham said, "We know the truth. It's not about 'the people vs. the dictator' in Syria. A majority of the population opposes the anti-government fighters. The heart of the conflict, more so with each passing day, is a struggle of the Syrian people and the people of the Middle East against U.S. imperialism, the former colonizers of the region--Britain and France, the Gulf monarchies, the powers that be in the capitol of the former Ottoman Empire and apartheid Israel. In this struggle, we stand with the Syrian people and demand, 'Self-Determination for Syria.'"